In 1859, with John Brown in prison for the raid on Harper’s Ferry, attention turned to the question of who had helped him. Bostonian Samuel Gridley Howe and five of his friends were nervous. Sanborn, Stearns, Higginson, Smith, Howe and Parker (L-R). Today Howe’s wife Julia Ward Howe is better known to history lovers, but in 1859 Samuel was more widely known. A physician, he helped establish the Perkins School for the blind. Howe, was also an active abolitionist. He had helped create an organization that attempted to settle anti-slavery voters in Kansas to turn it into a free state. Before it ran out of money, the organization purchased 200 Sharps rifles for use of the settlers. 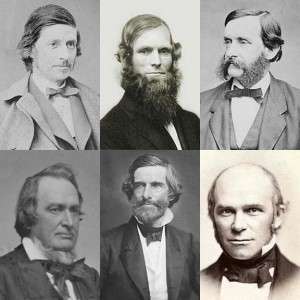 With the efforts to settle Kansas faltering, the six men who were behind the effort began discussing a new plan for the rifles. Known as the Secret Six, the group began listening to the plans of a Connecticut radical abolitionist -- John Brown -- who wanted to attack the U.S. arsenal at Harper’s Ferry in Virginia. Brown’s plan was that once he and his band of raiders captured the rifles at the armory he would hand weapons out to local slaves who would join him in the uprising. Brown and his miniature army succeeded in capturing the armory, albeit only for a day, but the uprising never occurred. Brown, an abolitionist from Connecticut, had tried and failed to recruit more men to support his efforts. In the end only 22 people participated in the raid. But he had convinced the Secret Six to divert their rifles -- originally destined for Kansas -- to Virginia to arm his raiders. Brown was widely viewed as a mad man. Government officials dismissed warnings about Brown's planned attack because it seemed so fantastically impossible. Frederick Douglass declined to participate. It was a suicide mission, he believed. But Brown succeeded in capturing the armory. He just couldn't get out once he had it. U.S. Marines under the command of Robert E. Lee recaptured the Harper's Ferry armory and took Brown prisoner. After a trial, Brown was executed - a martyr to his cause. In the North, the attack was viewed as a well-intentioned tragedy. In the South, however, it was viewed as a crime. And southern slave owners wanted to know who had backed Brown's efforts to deprive them of their property. In the aftermath of the raid, Howe was deeply concerned. Following Brown’s conviction in Virginia, for which he was sentenced to death, his Boston supporters raised money for one last appeal. They hoped to have Brown’s case reheard in federal court. Howe supported the appeal, but he realized that if a federal court took on the case he could be forced to go to Virginia and testify. He fled to Canada. Howe also went further and published in a New York newspaper a disavowal of any knowledge of Brown’s plans. He would later admit his statement was misleading, at best, if not an outright lie. As for the other members of the Secret Six, each responded in his own way to the aftermath of the raid. Franklin Sanborn, a school teacher who had provided funding for Brown’s activities, contemplated fleeing the country, but decided to stay in his Concord, Mass. home. He trusted the public would rise up to protect him if he were threatened. He was right. Federal agents did try to arrest Sanborn, but an angry mob of his neighbors thwarted them. Sanborn also denied advance knowledge of the raid, but defended Brown. He took it on himself to personally see that Brown’s children were educated. New York Millionaire Gerrit Smith, who contributed funds to Brown, destroyed all his letters referencing the raid. When he was publicly accused of funding Brown, he denied knowing anything of the raid. When he was accused again, he sought refuge in an insane asylum and said his recollections of Brown were foggy. George Luther Stearns of Medford, Mass., who actually paid for the guns sent to Brown, would destroy his papers related to the raid. He fled to Canada to avoid the controversy, though he later returned to Massachusetts to answer questions about his involvement in the raid. Two outspoken Massachusetts ministers in the group, Thomas Wentworth Higginson of Cambridge and Theodore Parker of Lexington, continued to support Brown publicly. By the time of the raid Parker had left America for Italy. Despite the failure of the raid, he remained convinced that the arc of history "bends toward justice." He died in Italy at 49 in 1860 of tuberculosis, just five months after Brown's execution. Higginson, Sanborn and Stearns would all make occasional trips to visit Brown’s grave throughout their lives.